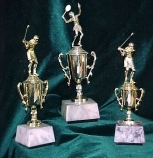 Trophies custom made for all sporting and atheletic events. Both male and female sports figurines are available for your next trophy order. Execellence and Victory to sports as varied as Football to Bowling to Golf.